Look, I’m not criticizing the people who are passionate about mission…I am one of those people. I was one of the people pioneering Missional Communities in the 1980’s and have been doing it ever since. This is my camp, my tribe, my people. But it has to be said: God did not design us to do Kingdom mission outside of the scope of intentional, biblical discipleship and if we don’t see that, we’re fooling ourselves. Mission is under the umbrella of discipleship as it is one of the many things that Jesus taught his disciples to do well. But it wasn’t done in a vacuum outside of knowing God and being shaped by that relationship, where a constant refinement of their character was happening alongside of their continued skill development (which included mission). This blog post is part of a 6 week series related to the release of my new, re-written edition of Building a Discipling Culture: How to release a missional movement by discipling people like Jesus did, which shows how we made disciples in a truly post-Christian context. If you’re interested in picking it up, click here. Wow, I really got a lot out of this! I love the car analogy. Great stuff! Thanks. When I was in High School, most people thought our best thing in youth group was a student led retreat called Gold Rush. Our pastor, however, always said that our best thing was discipleship, because without the discipleship Gold Rush could never happen. I think Spiritual leaders struggle to train others because they have been leaders for so long that they forget that they themselves had to learn how to lead. They think leadership happens naturally. Also, discipleship is a lot of work! But it is the most important work we do and can never be overlooked. We wanted to invite and challenge all members to regularly ask this of themselves and each other. In this way we are aiming to put discipleship as a community responsibility that identifies and grows discipling leaders and members for missional communities that (God willing) will be birthed from Vintage. Tying this with mission has created a vibrancy in the community as we seek out people of peace and begin to make disciples. For me, one of the exciting things is that we have members of our community who have been christians for decades and are now being sent out with renewed joy as they are released to make disciples – we have a great leader at kairos (@kairoscayer) who has released us to go out and make disciples on the journey of mission. Where I differ is two-fold. The “engine” that is missing is the power of The Holy Spirit working through the lives of every believer on a day to day basis. That’s how the first century model was powered. 2nd – much of what I observe as church planting bears little resemblance to the biblical examples given to us by our founding fathers. It appears to me that we are doing little more than attempting to reinvent ourselves yet again in the sincere hope of spreading the Good News. The problem here too is no power. Doug, I’d agree with you on the power of the Holy Spirit. But we have to learn to do that…and the Greek word for disciple in the NT is the word learner. So I’d attach the Holy Spirit issues to discipleship as well as we must learn to stay in step with the Spirit and discipleship teaches us to do this. I was thinking along the same lines exactly as Doug Rea’s comment when I see why people get burned out, so thanks for your reply Mike – I see such a great example of discipleship and learning in the Mary and Martha story, I hope Martha learned (as well as grumbled!) as she watched Mary simply sit at Jesus feet. (Luke 10). This story resonates a lot for me. In this season of my life where so much is bubbling and bursting out, stuff I so want to do and NOW, I have learned afresh the resting and waiting and listening and learning and am privileged to have those around me I can learn from. Looking forward to huddling! The Holy Spirit is the oil that allows the engine to work efficiently. Like the oil in any engine, it must be regularly topped up & occasionally totally renewed to keep the engine dirt-free and working at maximum capacity! This comment makes the Holy Spirit sound like a commodity. Secondary, after the all important engine. Rather, He is the convicter, convincer and giver of the life – the True Planter. I remember going to Colin Urqhart’s tour, in eighty-seven I think, in Bradford when he spoke about discipleship. He too made it the central element of our missional faith (although missional wasn’t a hip description then). It would be wrong for any follower of Jesus to disagree with you on this and so I wholly agree. A rounded faith of Biblical substance and Holy Spirit experience should equip the disciple in order to respond to the challenges of culture and society in mission. As Robert Zimmerman sand, “The times they are a changing” and those who do not follow the way of Jesus and look to blinkered religion are likely to “sink like a stone.” Keeping afloat means taking the call of Jesus to ‘make disciples’ and take it to heart in the relationships we have outside of the church. I am a great believer that, unless our friends want to come to church with us, the responsibility to influence their lives through a positive witness of faith is ours. Introducing them to our other friends, the ones we know hold a positive and accepting witness, is the way of Jesus isn’t it. He had twelve friends who he used to increase the witness to those God brought to him. The twelve were his chosen band of disciple makers and it was to them he spoke in Matthew 28. Put the Great commandment and the Great Commission together and you get people who Love God and others and make disciples. A good rule of thumb! Peace to you and God bless you! I don’t think the importance of this “word” can be overestimated! In many ways it looks like the world is leaving the church in the dust in mission- as the impulse to give back, to pay forward, to invest ethically, to share generously in the world is growing. Mission in the church without discipleship may cause good in the world, but is woefully deficient in making disciples od all nations. This is a really good post. It’s so easy for us to replace the simplicity of life with God (that is, discipleship), with other “good” things: commitment to “the gospel,” commitment to “mission,” commitment to outward success, commitment to church planting, commitment to our theological distinctives, etc. Ben – I love Keller’s definition of idolatry: Taking any good thing and making it an ultimate thing. Agreed! Keller is great on idolatry. Thank you for that Challenging article. Although I would wish that US and GB theologians and Pastors Gould stop using illustrations about THE World War II. No Wonder THE wounds won’t heal. Sorry, without a solid idea of what disciples you’re making then I can’t say whether I agree with you or not. Defined that in a comment above. But what the heck…I’ll throw another one out! Discipleship is the process of learning to do the things that Jesus did for the same reasons that Jesus did them. So it’s inherently about the shaping of inside of us leading to an outer Kingdom reality. To borrow from and amend Robert Mulholland (Invitation to a Journey)Discipleship is the process of becoming like Jesus by the gracious working of the Holy Spirit for the transformation of the world (or participation in God’s mission in the world). Notice how the participation in God’s mission is at the end of the sentence. Christian discipleship is Christian spiritual formation; Christian spiritual formation is Christian discipleship. Once the disciples were given authority and a mission by Jesus, they became apostles. Not only does the world need more disciples, it desperately needs apostles. God’s mission to reconcile, renew, and redeem the world includes the making of disciples. Those who make disciples are apostles. I concur with the author to a point. The reason “missional” so often fails is because – in part – because of an absence of VISION. In Renovation of the Heart, Willard notes that three things are essential to spiritual transformation; namely Vision, Intention, and Means. Discipleship, apostleship, AND mission all follow vision. If you can’t imagine who God is caling you to be (or who you already are in Christ), there’s a slim chance you’ll get started. To continue with the car analogy (and to quote Lewis Carroll), “If you don’t know where you’re going, any road will get you there.” And that whether or not you have an engine! So many churches and individuals waste their time on contrived visions. Jesus has already cast the vision (Matthew 5-7), and Paul explains clearly that God’s will is for us to become as our firstborn brother – Christ (Romans 8:28ff). Instead, the whole “God’s will” conversation has been made a joke by most people of faith. It’s terribly tragic. Yes, Christian discipleship (the way of Jesus) is integral to mission or missional (orienting our life to the mission of God in the world). However, without a vision of God’s intention for us – for the world – we’re just spinning our wheels. The question is always, where are we facilitating the true transformation, not learning, behavior modification or socialization, of people and our culture? I love this post and I couldn’t agree more. I’ve been coming to this same conclusion: if we want the church to grow and thrive, discipleship is key. I’ll be reading your book for sure! Missional will “fail” because it’s all the sturm and drang and drama of adolescence – of people paying $2000 to travel to the third world for one week of volunteer work building something, when that same money would support an indigenous pastor’s family for more than 8 years. Nothing’s wrong with going on a mission trip … but it is what it is – it’s primarily for the benefit of the one taking the one week trip. But in reality missional doesn’t fail … because all parents have to go through the teenage years. The real failure has two forms: (#1) never reaching the missional stage, and (#2) getting stuck there and never growing up and beyond it – which so many have! FANTASTIC post. Frankly, I’ve become increasingly annoyed at the quest for novelty in Western Christianity. Discipleship is definitely not hip or cool. Thank you for saying it. read Jonathan Lunde’s book Following Jesus, The Servant King, for another perspective which resonates deeply with what Mike writes. It is a good word and has brought the concept of “living as sent” to the forefront of the conversation, but as you have so well stated above when every man does what is right in his own missional eyes, then…. Completely agree with this. The danger is when we separate the two things or somehow say that we can do mission but discipleship is optional. I’ve seen missional junkies pick and choose the pieces of discipleship they want to do. I went on a mission trip to El Salvador last year and returned a stronger disciple. period. is it within the realm of possibility for us to be discipling *as we go* on mission? excellent…I think you are right. I have worked for many years in an organization that “plants churches” all over the Muslim world, India, Asia, and the global diaspora of these people groups. For a long time the workers were making disciples but not planting churches, so a push, appropriate I think, to take the next step toward church planting was adopted. It has been extremely helpful in making disciples. I have a question Mike. Is this post directed toward the covenant aspect of ministry within the Kingdom-Covenant construct, because our organization found that we need to plant churches where there are none,Kingdom, so that deeper issues of discipleship, covenant, could be dealt with. Appreciate you, pray for you and your colleagues often. mike, right on. would love to learn more how you customize your discipleship processes whether for ninjas or the normal especially as it relates to indigenous cultures and also for those who may not read or write. I would like to learn that as well, Dave. 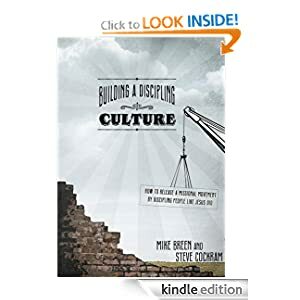 As someone connected to a tribe that’s calling people to a deeper level of discipleship and mission, it’s amazing how many folks there are even in “normal” American culture who no longer read or write but live life in an oral culture mode. What are some of the ways you translate the disciple and leader development process for the non-academics among us? John, the book is well worth it. Enjoy! I looked up the book, and there was only 2 of them, each for around $70, is there another place you have found them? Ryan, we are currently shifting to the new addition which will be available in hard copy in 4 weeks. However, it’s already available in ebook form in the various platforms. I agree with your comments. I’ve just finished reading a great book that seems to walk in agreement with your blog. I agree with what you are saying, I guess I never thought of being missional apart from discipling others. I am part of an orgtanic church group that has been meeting since early 2006, and our focus has always been discipleship, community, evangelism. Sometimes the three are in another order, but none is ever neglected. I would be interested in what your discipleship methods are. Kindly respond. Thanks Mike! I couldn’t agree with you any more. I have been having these same conversation with other leaders at our church. Maybe I’ll just have them read your post. It might help if they hear it from another source. God Bless!! Thanks Mike….always get a useful take-a-way from your writings. From one disciplemaker to another, keep on pressing on brother! Could some of you please fill the term »discipleship« with content – specifically? I would be interested. Discipleship is simply the process of becoming like Jesus. It’s the process of having more and more of his character which, in turn, allows us to do the things Jesus did. It’s about BEING (the inside of us, out heart and our character) and DOING (doing the Kingdom things Jesus could do out of his relationship with his Father). John 15. I am in him, he is in me ( becoming a disciple ) I bear fruit, more fruit, much fruit ( missional impact ). This is a great post, I completely agree. It’s very sad that a lot of our young people especially are going on missions trips in order to muster up feelings of faithfulness and devotion. But we’re dealing with people’s souls here, and if we don’t go into missions already having been faithful right where we are, then we are going to do more harm than good. Great thoughts here, Naomi. Thank you. It is a thing that requires selflessness. It is a thing that requires sacrifice. It is a thing that makes demands on me, myself and I. It is a thing contrary to how we are presently living. A thing so different that it seems to be light-years away. It is a hard thing; a difficult thing. It is a thing that requires me to get my hands dirty. Discipleship is something that can only be done by the power of God and His Spirit and His Word. Love it! Discipleship HAS to be the priority! Jesus is the number one example! He had his 3, then he head his 12, and then 70. Constantly discipling, taking people with Him in the journey called life! Without intentionally discipling others – there is no sustained mission – it is one and the same thing – indivisible. And nowadays the process has become more difficult because the starting product is so far away from the character of Jesus. We are so much more self-indulgent, so much more self-righteous and fighting for our rights. Even those of us who were discipled, and who have kept on discipling through the years see the greater difficulty in this than 30 years ago. In fact it can be a lot easier bringing to Christ and discipling among the Asian students that come to Australia from atheistic backgrounds than with those from even a “Christian” background in Australia. But still without discipling intentionally we have no disciples – i.e., followers of Jesus. Best i have read on missional movement in a while. I find that a lot of young people within my church want to go out, but they have no idea whose and who they are in Christ. They are still struggling with their identity while trying to tell other people who they really are. I agree with the commenter above who noted that it is true that you can’t have mission without discipleship but it is also true that you can’t have discipleship without mission. In my circle the problem is that we try and do discipleship without mission which feels pointless. I appreciated Mike’s response that they must come together because, in fact, they must. My only concern with the post is that the implication seems to be that discipleship must be prioritized over mission. If we prioritize discipleship over mission I think it fair to say that you could replace discipleship with mission in the post and title it, “Why the discipleship movement will fail.” I do not want to say that Breen beat up a straw man but I think the most serious thinkers and practioners in the missional camp see that while discipleship and mission can be talked about discreetly they also see them as inextricably linked. Uncoupling the one from the other will leave you with an inadequate basis for either. The real challenge it seems to me is how to do discipleship that is not mere information transfer and/or a pursuit of personal fulfillment. A group I am a part of will be beginning a study of Mike’s book at the end of September. Looking forward to more insight into discipleship that is not divorced from mission. We found that ‘huddles’ work well. You’ll find them in Mikes book. Interesting thoughts. But starts with wrong premise. The Missional movement has already succeeded. Hundreds if not thousands of creative churches planted. 10’s of thousands of outcasts have been loved and fed and reached. No need to piss on the parade. Take heart. God’s prevailing Kingdom – his Mission will not fail. Interesting that you think so Steve. I am unconvinced by the notion that a creative church plant and 10’s of thousands of outcasts etc. is doing anything more than breaking the ground myself. Certainly, that the Missional movement exists within the cultural paradigm shift is good but a lot of what the conversation has brought out has focused on being relevant to it rather than challenging the preconceptions of postmodernity. I don’t think it is helpful to talk about such an internal critique as Mike is presenting as negative and unhelpful. Truth be told movements that reject critical voices from inside as well as outside their ‘parade’ lose the ability to reflect on their direction and make their own king to follow. Reflecting on the priorities of Jesus and keeping the following radical and opposed to the ruler of this world in every way is helped by such a critique not hindered. Thanks for your thoughts and for calling us to wake up. Sometimes when we look at the Western Church we can be pretty discouraged. I know I am at times. But, I have hope that this failure will not actually happen. I see, like you, that we are teetering right now… but I have hope for my generation. We are desperate for something different. I think overall, if we look at Western churches I would say that you are right, they lack “true discipleship” in the sense of what my generation at least, is desiring. But I can’t quite knock the past and what it was. What church used to be, for the baby boomers… well, that was discipleship which fit their cultural context at that time. It wasn’t perfect by any means, but I think it “worked.” Society was different. Ethics reflected themselves differently. Social interaction was different. (People still left their front doors unlocked and had a milk man). In many ways, baby boomers experienced community… it’s just not the same way that millennials want to experience community. Neither one is better, they are just very different. Both with strong pros and cons. I think the Holy Spirit is guiding the Church into a shift. My huddle group talked about this one time. Baby boomers are no longer the largest population group, millennials are. So I think God is calling the Church into something different. People like yourself, God is using to say what Church was, and what Church should be. God is using people like you to help us shape what God wants, instead of what man has made it. I really like what you were referring to about discipleship as being messy and long. Bumps and bruises. Mistakes and victories. That is where I think we are going; at least some of us. I hope and pray that people recognize how jealous God is for His bride. That way they can respond to Him, instead of responding to attraction, or a full offering basket. I have hope that God will use young people to help call others into a deeper relationship with God through full discipleship, like you talked about. I don’t think we will first see this in the rooms of large churches. I think we will find it in youth groups, and in college ministries, and in young married groups. People doing life together, because they want something more. Why I have hope is because as I see these groups living life together I am seeing my parents generation beginning to catch on and support this, and even partake in it. I have seen elderly Pastors, near retirement, desperately concerned for the status of the Church, praising God for this transition that seems to be going on. A transition that they know is necessary. I don’t envy your position of authority at all. You are calling the Church, as a whole, into something that only a part desires right now. I know as I thought about sharing this on facebook, I wondered how many people might be offended. So thanks for your faithfulness. Your work, and your resources are bearing many fruits. Discipleship (conforming to the Way, Truth, and Life of Jesus) is what makes missional living sustainable. Without it we grow weary, discouraged, and only yield results superficially. Moreover, discipleship should be the aim of mission, rather than decisions that involve initial belief but not a change in behavior. I agree that discipleship is key, as is a firm understanding of your own identity in Christ. But I don’t agree with the assumption that missional communities, by their nature, lack proper discipleship. Surely that’s just a bad type of community, missional or otherwise. For the most part, I have always done mission out of obligation or wanting to gain acceptance from leaders and I think there’s many like me. Through being discipled and learning to hear from God for myself, mission is becoming clearer. Plus, I think you can do lots of mission and not ever hear ‘well done’ if we aren’t doing what Jesus set as priority which is making disciples who make disciples. Thank you for this insightful post. I definitely agree. Without discipleship, the church is doomed to a one-generation movement. With discipleship, the church can grow and take “new territory.” We must always be careful, too, of the types of disciples we are making – Matthew 28 says clearly to teach others the things that Jesus said and to obey God. One’s calling, or “mission”, in life only becomes clearer in the context of a relationship with God (where we obey what He tells us) and others (who help us figure that out and point us to truth). Christianity is inherently relational and when we lose these relationships in the body, we lose our power as a church. Great post…definitely drew some conversation! As seems to be the case so often, we are limited and tempted because of language. I would challenge that those who are focused on mission without discipleship don’t have a strong case for using the word “missional” – and vice versa. This word is all about recognizing that we are ALL called by God to join in what God is doing in this world. Not just called to go do stuff – but to join God in community. Being invited to live in the midst of God’s mission…WITH God. This is impossible without discipleship…and discipleship is impossible without it. I completely agree with your statement that by focusing on making disciples the church grows naturally. However, it seems that there are those (not putting you in this camp at all) who are so focused on individual discipleship that they’ll actively work against the church growing out of the process. Its as if we’re drawing lines – you can plant churches or make disciples. What I believe, and what I believe you’re saying, is that these must be understood as not only complementary but inseparable. I like the word missional because it seems to recognize that spiritual formation/discipleship, mission, evangelism, worship, etc., all have something to say to our lives, whoever we are and wherever we are. It incorporates our existence as both the gathered and scattered church. To whatever degree the word missional ceases to function in that capacity, I’m fine letting it go. Completely agree with all of this and couldn’t say it better myself. Mike. good to see you stir things up. again. greetings from turkey. i dont see a big disconnect between missional and discipleship – same source and example in Christ – but i would say that our discipleship must be missional in that a discipled life may look different in different global contexts and being sensitive to that will keep us from putting our own cultural biases on what discipleship must look like onto other new disciples from contexts different than our own. Outside of the trades (carpentry, plumbing, electrician, cabinet making) our culture does not know how to apprentice (isn’t that what discipleship means?). All of teaching/training is done through classroom/lecture models. We don’t walk all with the the “master” level evangelists, teachers, or apostles. We receive a lecture from them and then go away and do homework. The structures of western church will keep us from becoming mature disciples. Mike, I believe you are absolutely right, however, I have always understood the missional movement as one that flowed out of discipleship. I know there are some who see it as the main focus of ministry but I believe most who truly understand being missional as the fruit of our following Him. That said, I wonder, as you have titled your post, do you see the missional movement as hopeless in America or are you warning those of your “tribe” to see the primacy of discipleship? I would agree we are way lacking in both our understanding and praxis of discipleship in America. This is a detriment to any Jesus movement. This would be more of a warning to the tribe I’m a part of as I look out onto the horizon, making a comment on the current trajectory it’s on if we don’t change some significant things. Great thoughts, Mike. And probing. Interesting thoughts Mike. One of the big challenges I see is helping people to understand what it means to be a disciple of Christ. Too many folks equate discipleship with gaining more knowledge about Christ and His Kingdom. We lament that many in the church do not have a good grasp of Scripture which is true, but it is equally true that many have stuffed their heads full of knowledge but are still not truly disciples. Christ’s disciples learned at the feet of their teacher in the midst of mission – doing life. Although that might sound simplistic, if we were able to emulate this, perhaps people wouldn’t find discipleship “boring”, we would discover that all of us are still learning and that discipleship and mission is something that we “do” but something that encompasses every facet of our lives. That last line should read…”discipleship and mission is NOT something that we “do” but something that encompasses every facet of our lives. Not a perfect analogy? Least perfect analogy ever!!! The Red Army sent in untrained people as a *tactic*, on *purpose,* to help them defeat and exhaust the enemy — and they succeeded. Anyway, other than that, great thoughts. Without knowing the word, we can’t do much. God is spirit and spirit is truth. Truth is the word. Without studying God’s truth, which is understanding his heart, we can’t be a disciple or effectively do missions. And we can’t just read the Bible with our minds. We need to read it with our hearts or it will just be knowledge puffed up. It’s crazy…. You read all the posts, the responses…and the responses to the responses…and then you hear that still small voice say,”Kid’s c’mon get it together..I’m coming back! Quit playing semantics with words…wake up, get dressed, and get going!!! When it’s ALL said & done, what difference will it make what we call it, how we define it, and how we expound on it to sound intelligent! Thank you for this blog post. I have read it and found it to be very disturbing for 2 reasons. Firstly your opening statement give the impression of arrogance and that can’t be a good thing for those you are teaching to be disciples of Jesus. Secondly you give the impression that those who have a missional focus to their lives are some how inferior to the discipleship focused people. In Matthew 28, Jesus made it very clear that all are to ‘Go’ and ‘make disciples.’ I agree with you that if we focus on missional work without have a discipeship frame work for those people to fit into, we will be less that successful. But is ‘our’ failure or ‘success’ the important thing to consider. Should we not rather focus on being Christians, that is disciples of Christ, which will make us both missional and discipling and leave success and failure to God as it is His responsiblity? Unfortunately, you post has created a divided in the minds of many people who’s comments I have read. Why is it to simplistic for us just to be Christian? Vic, hopefully my followup post will provide some clarification on this point. I’m certainly not trying to separate discipleship from mission but rather say mission is one aspect of discipleship, that mission is at the heart of discipleship. What I hoped to convey was a concern about how so many people are doing stuff for God (mission) while not terribly passionate about knowing God and being shaped by that relationship. I want to say you can’t have one without the other. It’s a false dichotomy. With that I can agree, Mike and thank you for your reply. It is possibly the words used that conveyed a particular sense or feeling. Thanks again for the reply. Thanks for this provocative article, Mike… my only plea is, can we find another word for discipleship? Not because I don’t love the concept and want, like you, to make it the priority, but because it is for many christians a container to be filled with whatever meanings we choose. It doesn’t pin us down enough, and leaves us free to justify whatever our own brand of apologetics / teaching / behavioural therapy is. I’ve been in conversations where people with radically opposite views of what should happen are both using ‘discipleship’ as their trump card. I appreciate your attempts in comments above to define it further – but is there not a simple word that does this? Is formation a better term? I have to agree with Gerard on terms and definition. I think your post is convicting, provocative, yet it lacks a helpful definition of discipleship. Your responses to those who have made similar statements remains vague. Historically, a vast majority of the church’s practices have been thought to be centered around discipleship (teaching followers the way of Jesus). Are you stating that such practices (ie. liturgy, service, …) do not do this? Are you saying that we need to be mentors? Be “relational?” Give us something to sink our teeth into, Mike. Or (and this is the cynic in me) was this just a carrot to get us to buy another book to find such a definition? Maybe it’s the three orientations that matter: towards God, towards each other, towards the world at large. If these orientations are all developed, whether we call it discipleship or mission, it ends up being the same thing – following Jesus fully? I can work with that. Good synopsis, Geoff. Great thoughts, Gerard. I feel as though I’m often stuck choosing between whether to scrap certain words because they’ve lost so much meaning and we need new words or doing my best to redeem the old word. I suppose in this case we chose to stick with discipleship because much of our work is for laity who, when they read the Bible, would probably intuitively understand disciple and discipleship moreso than another word. That being said, I’m happy to be proved wrong on this one. I care more about making it as easy as possible for people to understand and lovebird the life of Jesus. Our “missional” activism started with youth ministry in 80’s church. We had a discipling plan in place, and yet got stuck in church after a while, just “feeding.” Church seemed to have a default of measuring faithfulness by attendance. Seemed a dead end. So we started a simplified (simple-church) mission based on Luke 10, met in the home of an enquirer, introduced her and her friends to Jesus, then we knew we had to continue to develop them. By late 90s, we experimented with creative modes of worship to find their worship languages, and with some success. After a while we got stuck feeding again -Christian Consumerism. Then we made connections with community development models, and beefed up our holistic engagement in the real world in early 00’s. Contributers not consumers. Intentional about how we expressed our faith in Spirit, Word, and Deed. But then there are the conflicts, and we had to learn more about conflict resolution, and recently about leadership as managing fallen people (not just ideal models of how things should work – they never do work as they’re supposed to). There have been some new converts, but not all have grown well since their new birth. Some have, but it’s always those who gravitate to leadership who grow best. Is this because they benefit from the extra work, or do they already have that contributer mindset in place? Chicken/egg? I dunno. Right now we have stepped back a bit from community development, and need to rest and recuperate. We just couldn’t keep being as involved as we were – it was too painful. We meet to pray, study scripture, keep our eye on the neighorhood missionfield but don’t know what to do next – just rest for now, awaiting new orders from the King. I’ll just go now… be over here… packing for a camp… or reading… Bye. When the “missional” movement began to really be noticed, I frankly wondered what all the fuss was about. What was so radical about being a church on mission? Growing up in the home of a small-church pastor, both ourselves and the congregations were always engaged in this “missional” behavior. As well, discipleship was taught and modeled before the ‘discipleship movement’ came to the fore. Now at 27 years into my own ministry, these ideas still form the core of my ministry philosophy. Knowing what Jesus wants us to do isn’t difficult…all we have to do is read His instructions. I wonder how many books we have to purchase and how many seminars we have to attend before we realize that it’s all right there in the Great Commission? sans e-reader is there any way to get a copy of your revised “Building a Discipleship Culture”? If no, you might force a geezer to buy a kindle against her will. LOL. We are hoping to have it in hard copy in 6-8 weeks! Thank you for this article Mike. I completely agree that discipleship should be an essential piece in the missional church movement. I’ve already seen another symptom, if no one else has pointed this out yet, that much of the missional conversation is about ‘saving’ Christendom from impending doom. I’m beginning to see alot of missional language and community creation as a ‘means’ to ‘save’ Christendom or the last vestiges of Christians managing the culture. What if, in kingdom-discipleship, we learn that our job is not to save old wineskins with new wine. If there’s no discipleship, we will continue to play with old wine (ethos of Christendom) or old wineskins (structures of Christendom) with either new wine (new direction from the Spirit) or new wineskins (new structures birthed from the Spirit’s ideas). Many of our “Christian” initiatives go for the bang while leaving out the essentials such as discipleship, worship as a lifestyle, connection with God, self control and reliance upon the Holy Spirit. We like to focus on ourselves rather than focusing on the Lord. We prefer our vision rather than his. Most excellent reminders. Thank you. Maybe a syllabus is required. A checklist of sorts. Great early-morning read this morning Mike – together with all the comments. I am reminded of Jesus’ initial words in his High Priestly Prayer. He expresses the truth of who he is and of what he had done as the foundation of his prayer. It is deeply about relationship and representation (covenant and kingdom). If I understand discipleship to be all about relationship and representation (C&K), then indeed you can’t have one without the other; mission without discipleship is an oxymoron. So is discipleship without mission. I believe that without the sustaining grace of God and the power of the Holy Spirit neither discipleship nor mission is possible. I’m sure you believe the same thing. And I took from your post the idea that a faddish Johnny-Come-Lately infatuation with mission – as a thing to do – can too easily become the opiate of the faithful, and this is a greater danger in the current USA context of Christian Mission than self-righteous discipleship that focuses only on one’s own relationship with Jesus apart from our relationship with others and a mission to the world. Truth is – and I know you believe this strongly – we need ’em both. But the sustaining power for both is the grace of God in Christ and the work of the Holy Spirit grounded in the Word and experienced in the Church (not necessarily the building, but the fellowship of the redeemed). A lot of these comments are proving Mike’s thoughts accurate. I guess if you haven’t had someone show you how to follow Jesus, you wouldn’t know how to do it. That’s a pretty big assumption, Brian. Rather than judge others prior discipleship, ought we do better to ensure that our articulation is clearer? Jason, I receive that. It is going to be difficult though to have accurate communication, unless we are face to face. I think that is one of the points of this blog, ironically. The “practices” of discipleship seem so basic, but the “playing field” is so compelling as to make us forget NFL teams spend a day in rest, then five days in practice before every game day. Thanks for the reminder to practice! I believe whenever we loose scriptural balance in evangelism or mission we fail like the disciples who failed themselves because of the absence of prayer and fasting. I believe discipleship is a key piece to build a spiritual foundation for mission. Thank you for your blog. I is what we need to hear at a time when the church is unbalanced in so many areas. I believe that we get so caught up with labels and end up arguing and debating issues which have absolute no value in accomplishing the goal of the “missional” model or “discipleship” model. When we fail to understand that God’s Love is to have skin on it and that those who claim to be His followers need to be in relationship with Him then both groups fail. There are two sides to a coin. The Missional movement is countering an excess in the Discipleship movement that became very militant, mechanical and self-righteous. They forgot about a loving relationship that involves the whole person, the here and now and the future. People were taught to win arguments and debates, to have the right answers to questions but forgot that God’s love requires skin and bones – offer your bodies as LIVING sacrifices! Christ’s life, death and resurrection is intended to be seen in loving acts. It’s not just about filling the head and becoming strong – its about becoming God’s loving people IN the world and not isolated from it. All models have their flaws perhaps a better approach to constant criticism and debates about which is better ,how about encouraging one another in our efforts to Love the Lord our God with all our heart and with all our soul and with all our strength and with all our mind and ‘Love our neighbor as ourself”…and don’t forget your enemy too…you know those “missional” or “discipleship” people. Mike, thanks for the post and the leadership! I truly feel that placing discipleship at the forefront of our current “missional,” “incarnational,” or “organic” (or whatever catch phrase you want to throw in) church plant has done more than simply increase our chances of surviving. It has transformed my life, including my walk with Jesus, my relationship with my wife, my core team, and the church in general. Keep up the good work! When will the newly-rewritten book be available in hardcopy format? We’re hoping to have it available in the next 6 weeks, JT. Hurrying as fast as we can! The best way to measure your disciples are to look at their disciples. – master plan of evangelism. Slow and gritty day to day discipleship is the way to do it, way more is caught than taught in a lesson plan. This is such a hard thing to do. Super encouraging article, convicted me in being lazy, settling for meeting with guys once a week rather than giving my life away. Thanks for the thoughts Mike. I understand & can relate to the feeling behind your post, probably from the hangover many of us have, from our experience in the mega church or missional communites related to a missional posture devoid of proper discipleship. However, looking at the illustration of the car at the beginning of your post, you’ll see something that is being minimized by the conclusion of the post; The engine “discipleship” drives the wheel “mission.” That’s very true & the better the discipleship, the better the missional practice – couldn’t agree more. But, in the picture the wheel has no bearing whatsoever on the engine. I believe this is not the case in our spiritual journey. Richard Foster, among many others, identifies “service” or serving others as a Spiritual Discipline – because service actually can be very formational is our process of becoming like Jesus. If I wait until I’m ‘fully formed’ or fully discipled & able to form other disciples, I might wait a long time before serving, not to mention I might miss out on that important piece which can propel me along quite a ways in the process; being on mission. Had the woman at the well waited until being properly discipled she would never have told the village about Jesus, the village would never have come to him, she might never have grown from witnessing the blessing others gained or the affirmation from them also accepting Jesus & his message. The 70 disciples were sent out by Jesus well before being ‘fully discipled.’ Many, if not all, had, at this point, little clue of who Jesus was or the true depth of his mission. In fact looking at how Jesus discipled, it seems they all, discipler & disciples, ‘went’ from day one. They were ‘in the field’ healing, feeding, casting demons, accepting hospitality, speaking of the kingdom, fighting the religious establishment, making wine & raising the dead while Jesus’ discipleship process was under way. Conversely, they didn’t sit at Jesus’ feet, (the discipleship classroom), for three years before ‘getting on mission’. We learn best by doing & it seems that was something Jesus tried to show us. Maybe we’re asking the wrong question; perhaps it’s not which is first – seems pretty obvious that a good discipleship process should bear fruit in a missional sense – but rather how can we insure we incorporate appropriate mission into our discipleship process. Will, good thoughts. I wrote a follow up Part Two that I think gets to the heart of it. If you make disciples, you will always get the church. But if you try to build the church, you will rarely get disciples. God has been transforming our church. We’ve been striving to follow His lead in making disciples. We’ve learned that discipleship is ALWAYS relational, ALWAYS transformational, ALWAYS centered on Christ and almost always SLOW! One of my greatest tensions comes in your statement. As we focus on building disciples it seems you’re right we are building The Church but not A church. The pressure from the organization is to build A church not The Church. Thus I think we see the root of problems rising in the American Church in particular…at least in ours. Pray for us as we continue to follow Jesus in making disciples! Thanks for your insights, I look forward to picking up your book. As missional people we can become so committed to reaching our own culture that the cultures and peoples of the rest of the world end up taking a backseat. …Although church planters are susceptible to measuring their affectivity based on the number of people who attend their church they face another straying purpose for their existence-numbers of church plants or being a part of a church planting movement. Wow! I just came across this article, Mike and couldn’t agree more. I must admit though when I ask myself those questions I am saddened by the answers, God help me!! May I please re-post this and perhaps others as well? David, feel free to repost! It appears I will be the lone dissenting or qualifying voice here. Where the “missional” push is happening without solid grounding in Scripture, yes, it will fail, just as all trends and clever marketing pushes fail the church. Believers who are not grounded in Scripture, who do not understand sound doctrine, who have never learned to recognize the guiding hand of Christ, are not likely to change the world for Christ. Churches that don’t make this teaching a priority — and many do not — may increase their membership rosters, also are unlikely to change their communities. A “missional” movement like that is simply going to fail. That’s not what the movement is about, though. The intent behind being “missional” is to get past the ghetto experience of Christianity that increasingly has defined it the past 20 years or more, where the church is walled off from the rest of society and has no role in the larger culture beyond that of a nagging parent or, worse, a hostile foe. It’s about taking solid teaching, a deep grasp of who Jesus is, and an excitement for inviting people to respond to his life-transforming message in a way that is relevant and meaningful to them. It’s understanding that for many American evangelicals, larger American society has become a missions field — it is somewhere they no longer feel entirely comfortable like they would on their own native soil. Even though American evangelicals speak the same language, go to work at the same places, and have other things in common with their neighbors, they don’t have the same values as their neighbors, lack many of the same basic assumptions about life and the basis for those values, don’t listen to the same music or watch the same TV shows, and on and on. The evangelical church has become a side culture, rather than a countercultural movement within the larger culture; and increasingly the two cultures view each with incomprehension and unmitigated horror. The “missional” movement within the church is about changing that by equipping evangelical Christians to think along the same lines a missionary might think, the way Paul modeled at Mars Hill and elsewhere: get to know the culture, the language, the people, befriend people who are different from you, and discover the hunger for Christ and for renewal that lies at the heart of every culture, and then share it. If that movement fails, God help us all. Such an excellent and timely post. In a world obsessed with personal branding and social media, the emphasis often strays from being truly all about life-touching-life, Christ-like discipleship. My number of Twitter followers is, quite frankly, irrelevant to Kingdom work. What matters is the time I spend intentionally investing in people’s lives. I’ve read and re-read and gotten a lot here. I generally agree with what I’m reading here and it’s well-said. If I could push back a little on something you’ve said maybe you can help me understand what you mean a little better. My question is what do you mean by “mission.” I see and agree that potentially everything Jesus taught could for the same reason fall under the “umbrella” of discipleship. (if that’s consistent with what you said. Please correct me if I’m wrong) So help me understand this in the context of the missio dei (Mission of God that he’s been on mission since way before Jesus was discipling on earth and even before Abraham). Is it that mission (as in being missional is under the umbrella of discipleship which is under the umbrella of mission dei which is under the umbrella of the Kingdom of God? Help!